During today’s sneak peek announcement of the monochromatic Visual Studio 11 Beta to be released next week, Microsoft slipped in a new screenshot of the PowerPoint Storyboarding tool that will ship as part of Visual Studio 11. 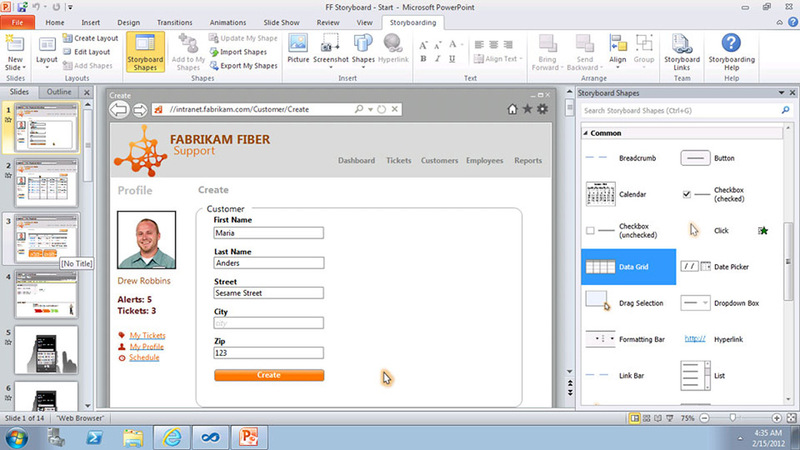 The tool which ships as an add-in for PowerPoint will allow designers and developers to quickly mock up wireframe-based prototypes of their application using familiar presentation tools and animations, along with a host of UI controls which they can drag and drop to replicate a real application experience. Windows desktop, Windows Phone mobile and web applications are all supported with a range of templates and controls suited to each scenario. In contrast to Expression Blend SketchFlow which builds XAML-ready prototypes with real controls stylized to look like sketches, I think PowerPoint is a much easier tool for earlier stages of the design process. The fact that Expression Blend is dog slow, difficult to use and makes crappy XAML doesn’t help its cause either. Since it’s been revealed internally at Microsoft they use PowerPoint to prototype designs, it’s no surprise a need for such an add-in exists. The only catch however is that so far all signs of the availability of this tool has been tied to the enterprise-focused “Team Foundation Server” edition of Visual Studio. The designer in me hopes this tool will make its way down to all SKUs of Visual Studio 11 since it’ll make our job of making beautiful Windows applications that much easier. Side note: I’m holding my breath to see the availability of .NET Framework 4.5 Beta which was also announced today. WPF applications like my MetroTwit would benefit from performance and memory usage improvements but the word is still out whether it will support all the current OSes – XP, Vista and 7. MS PowerPoint has to be the single worst application ever made. I don’t see how this add on would make it easier. I agree that some of the presentations that come out of Powerpoint are garbage, but I don’t think Powerpoint itself is all that bad, and definitely doesn’t deserve the title of “worst application ever made” since I can think of dozens of worse programs, and top of that list is iTunes for Windows. yeah, “worst application ever made” is OBviously iTunes for Windows. Wow, it’s awful. Rich Coleman, I stand corrected iTunes is the worst program ever made, you are absolutely correct. But Ukimio the PowerPoint program is fraught with horrible design tools, awkward ways of doing things, no work flow ease and it comes built in without being able to save consistent styles for your needs. But yes, I also realize that people who use this horrible tools are generally not designers. And there are very good reasons why most designers won’t touch this tool. I’m sorry guys… Apple’s success like iTunes are in how specific and nice their user interfaces are. If only MS developers can share those eye to detail. Unfortunately, Apple programmers are artist while Microsoft developers are merely plumbers. MS PowerPoint and every effort MS can do to bring MS developers to that stature will be the right directions. Application software is not anymore about the backend or plumbling… it’s how inviting it is to the consumer (your customers). I just think you MS developers just don’t get it yet. uh oh, we have an apple troll over here! You might have gotten away with it if you didn’t say that in a thread about iTunes. I thought SketchFlow or Visio would be the products they’d want you to use for this type of thing, not PowerPoint? I think it’s more replacement for Photoshop style concept presentations. It’s a mock up tool. I doubt it has same interactivity as Sketchflow has. So in future you would use Powerpoint for UI mockups (what product will look like) and presenting them, and Sketchflow for UX (what product will feel like). Sounds great. I think it makes a lot of sense for people that live in PowerPoint (business/marketing/sales) and have no idea what Visio or Sketchflow is what-so-ever. Ok, I just realized this is not IN PowerPoint but in VS11 – ok, THAT doesn’t make sense. Why wouldn’t they just make it an add-on for PP without VS11 being involved? weird. @Rich, actually this is a PowerPoint Add-in, but the add-in ships as part of the Visual Studio 11 family of features to support application lifecycle management. I use PowerMockup, which is also a PowerPoint add-in and has similar features. You have mentioned performance and memory management improvements in WPF with .net 4.5 can you shed some light on this or drop a link, as a developer I’mvery keen on this. I was told directly by Joshua Goodman of the .NET/CLR team at //build that .NET 4.5 does not support XP. @Sameer Here’s the msdn page describing the updates for WPF. We’re hoping for perf improvements as well. I don’t get why this isn’t done with SketchFlow either. If they need mockups in the form of presentations for manager types, why not create something that lets SketchFlow output a design as powerpoint slides? That’s a common question I get whenever I show off PowerPoint Storyboarding, thank you for asking it here. SketchFlow is a great tool and can already output read-only versions of a prototype/mockup which a stakeholder can read. But SketchFlow requires a bit more of a sophisticated skillset to work with, whereas PowerPoint has an incredibly high adoption (especially in corporations) and far more people know how to use PowerPoint (at least at a basic level) as compared with a tool like SketchFlow. So think of this as a way for “the rest of us” who aren’t experts at Expression SketchFlow to quickly get started with creating and sharing storyboards which can inform the development process. If you have the skills to use Expression SketchFlow and it’s working for you, then chances are you will want to continue to use that. But if you’ve been putting off learning SketchFlow yet you would like to try storyboarding as a way to rapidly and cheaply iterate on UI and workflow before investing in code (which is slower to iterate and more expensive to author and maintain), then you might want to check out PowerPoint Storyboarding. Unfortunately, Sketchflow is not quick and easy. You can’t give Sketchflow to just anyone and say, “Here, design something with this.” They probably won’t even be able to figure out how to drop a button on the design surface. The advantage Sketchflow has is that it produces *working prototypes*. Using it for basic mockups is a waste of time and effort. That said, I can see why PowerPoint Storyboarding would be appealing to many people. It’s quick and easy. That makes sense… but even then, I wonder what could happen if there was a powerpoint-like interface for SketchFlow, where people who know how to use PowerPoint can create basic SketchFlow mockups. @Bob, I would be interested in hearing more about the approach you describe. In your opinion what would the benefits of such an approach be, as contrasted with having them as two separate tools? Have you heard of the Keynotopia templates? Awesome for rapid prototyping in PowerPoint (they have them for Keynote too). I would definitely look them up until the Microsoft release- they’re really helpful for wireframing/mocking-up web, mobile, or desktop apps 🙂 Very easy to use too (I was a beginner when I started) with drag/drop options. [1st I am obligated to say I work for Microsoft] – There are some people who hate PowerPoint on this thread. I wonder if you have seen PowerPoint 2010? I mean features like the ability to remove a background from an image with a few clicks? The ability to broadcase a presentation to any browser enabled device (iOS, Android, Blackberry, Windows Phone, etc) without requiring any additional software. OK the ability to embed your presentation into a blog post is pretty cool. I know there will still be a few people who do not care about these features. I would also venture to say there are several people who did not know about these features and just as many who have never tried them. PowerPoint has some amazing gems. Try http://www.windows8templates.com for Windows 8 Metro-style prototyping in PowerPoint. You could probably hook it right up to VS with Storyboards. I love PowerMockup and use it as a compliment to our PowerPoint plugin product called PowerStory http://www.power-story.com, which focuses on helping you build the flow of UI Storyboards based on uses cases, and then generates test cases automatically either into MS Word or into Microsoft Team Foundation Server. PowerStory which is a PowerPoint Plugin, allows you to define use cases directly within PowerPoint including the main and alternate flows. Each step in these flows is automatically associated with a PowerPoint slide, on which you can use tools like PowerMockup to create your UI designs. This will ensure that your use cases and UI Storyboards are always in sync and also will reduce the number of duplicate UI Mockups slides you will need to create. For exaple if you were to take a common login use case you would likely come up with about 11+ different UI storyboards with a a lot of ui mockups duplicated across all of these Storyboards. If instead you associate a UI Mockup with each step you will only create one UI Storyboard that can handle all of the same different alternate paths defined within the use case. An additional time saver, is that PowerStory will generate a proper test case including images of the UI mockups for each unique path through the combination of steps of the main and alternate flows. These test cases are automatically generated and can be exported to MS Word or to MS Team Foundation Server with automatic traceability to requirements. Not only does this save tremendous time and budget typically spent on manually translating requirements into test cases, it also ensures the test cases are 100% consistent with the use case/UI Storyboard based requirements. Powerstory is slow and it doesn’t recover the data if MS powerpoint crashes. It took like almost one hour to install and the output isn’t worth its Money. I think this plugin requires a lot of work and it wouldn’t hurt to make the library items simple to use. Sorry you seem to not like our product as others do. But we do appreciate the feedback. I know what you mean about the install time. Sometimes the install can take a while as there are a few Microsoft Libraries that need to be installed in order for the plugin to work. The actual install of the PowerStory product only takes about a min, but depending on the Microsoft Libraries you don’t already have installed on your machine the longer it can take. The one that takes by far the most time is the installation of the .net 4.5 extended library. If you already have that installed then the entire install process only takes a few mins. In terms of the data recovery comment, we simply leverage the existing data recovery that is built into PowerPoint, which does create recovery files. All feedback is good, even when it is tough feedback like yours, but we truly do appreciate it. We do get a lot of positive feedback, but it is only natural to get some negative feedback as well. Like any product some will love it and some will not, but we are always striving to improve it.